What are the symptoms of a failed A/C compressor? When your air conditioning compressor is broken, you know it. You can run the AC for hours, and not push any cold air into the passenger compartment. If this is the case, it may just need the refrigerant and oil changed. But if this does not work, then it's likely the AC compressor or the compressor clutch need to be replaced. Typically, a non-functioning compressor will still have a pulley that functions normally. So there is little risk to the rest of your engine accessories or drive belt. However, it could possibly indicate that another problem exists within that system that is putting excessive stress on the AC compressor clutch that may have caused it to fail. Either way, if your compressor won't work then you won't get any air conditioning. In the summer months this could be unpleasant at the least, but most likely it will cross the line into unbearable. And don't think that by simply opening your windows you will effectively cool the inside of your car. Nothing is more efficient that a properly functioning air conditioning system, and the drag (aerodynamic wind resistance) of a car with the windows open is worse for fuel economy than when the AC compressor is running. Do all air conditioning systems have compressors? The first air conditioning system installed in automobiles dates back to 1939. It was offered by Packard and was wildly expensive and inefficient. It wasn't until 1953 when Chrysler finally debuted a sensible and effective air conditioning system, and in 1954 when Nash followed up with one of their own. This put AC at the top of the options list, where it would remain for decades until becoming standard equipment. The heart of any cabin cooling system is the AC compressor driven by the serpentine belt over a pulley. While the air conditioning is off, the pulley still rotates normally. When the air conditioning is turned on, a switch magnetizes the AC compressor clutch which uses the rotation of the pulley to spin the scroll pump inside the compressor. This compresses and pumps refrigerant which is responsible for the pressure changes that cool the evaporator core where the blower pushes cold air. Magic, no - just pure science. Replacing your AC compressor is no easy task, and requires professional installation since you are exposing refrigerant (controlled by the EPA) to the environment. Without proper exposure prevention and disposal procedures being followed, it is illegal to perform this job. 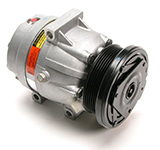 Needless to say, we can tell you that changing the AC compressor is very similar to changing your power steering pump. The hoses that connect the air conditioning system should be disconnected from the compressor, the belt should be removed from the pulley, and the compressor should be unbolted and removed. Re-installation requires you follow the same steps in reverse order. Obviously, priming the system requires you to apply vacuum to the system that usually cannot be done by a DIY-er. Do the smart thing and take your car to a HVAC technician to get your AC compressor fixed or replaced. Even changing the AC clutch and pulley requires the removal of the compressor, so having a professional do that is both the safe and legal thing to do. Getting the best new HVAC parts. There are a handful of AC compressor and AC clutch manufacturers producing replacement parts for your car or truck's air conditioning. Some brands are either the original equipment or top quality manufacturer, others are cheap reproductions. At Car Parts Discount, we offer the best air conditioning compressors and clutches for your vehicle. Our brands include new OEM's, rebuilt originals, or reliable replacements produced from quality manufacturers. Plus, our parts are in stock and ready to ship. This means, you aren't too far from fixing your air conditioning compressor or AC clutch if you need to do so.